Bedding is a necessary household item, but it can be bulky and take up precious space in your home. Finding ways to store your bedding doesn't have to be challenging when there are several easy solutions to consider. A cedar chest makes an ideal place for storing blankets and bulky comforters. Cedar is a natural moth repellent and an excellent choice for storing wool blankets and other bedding, but you aren't limited to cedar. Any wooden chest in a contemporary or old world design can become a prized addition to your bedroom décor. Once you select the chest, you need to place it in your interior so it becomes a natural part of the room design. Set the chest between two low chairs like slipper chairs or perhaps next to a chaise lounge. A steamer trunk design is tall enough to pair with any chair or loveseat sitting area in your bedroom. Use a blanket chest with a mirror above it, a vase of flowers and a tall lamp to dress up a vacant corner, hall or alcove. Overall, a chest is a good solution to your storage needs, but there are some points to consider. You can store a lot of bedding in a chest. The chest can double as a table when using it in a sitting area. You may be tempted to stack items on the chest, but you'll regret having to clean off the top every time you need bedding linens. A chest takes up floor space, which can be a problem in a small bedroom. 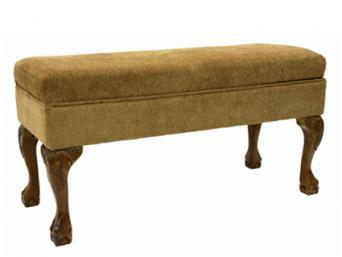 An upholstered storage bench offers a great solution for storing blankets, comforters, pillows and sheets. Storage benches are definitely versatile. Add a bench in the guest room at the foot of the bed. Use the bench as a play table in child's bedroom. Storage benches offer convenience as well as a few drawbacks. The dual function of this type of bedroom storage bench gives you another piece of furniture to sit on. You can also use it as a place to put on your shoes before setting out for the day. A hardwood bench can be uncomfortable without a cushion, but the cushion needs to be secured with Velcro® fasteners so it doesn't slide off when you lift the lid. Like a chest, a bench can make a small bedroom feel even smaller. There are many under-the-bed storage alternatives you can use to retro fit your current bed and turn the space underneath into additional storage. IKEA makes a two-pack "high bed" storage box with rollers for different bed sizes. A large plastic under bed storage box with a lid may be a good option for you. Rubbermaid offers a molded plastic under-the-bed storage box with rollers. A zippered natural canvas storage bag lets blankets and comforters "breathe," which prevents moisture buildup that causes mold. Think about some of the advantages and disadvantages that come along with this type of bedding storage option before you decide if it really suits your needs. Under bed storage takes advantage of otherwise wasted space. Extra bedding is hidden from view so the bedroom won't look cluttered. Some under bed storage lack rollers and aren't easy to retrieve. Opaque containers make it impossible to see what's inside, so you may pull out the wrong container and have to put it back as you search for what you need. A chest with deep drawers is another fine storage option that's perfect for bulky comforters and pillows. A three-drawer or five-drawer chest that goes with your bedroom suite is an excellent option. Another style features woven pull-out baskets with a top shelf deep enough to hold a couple of blankets. A chest of drawers is often a standard selection in a bedroom suite. Consider its height when placing one in a bedroom with slanted walls. Avoid setting one beside a door; it will interfere with the room layout. Place the chest between two windows for a balanced look. A chest of drawers can be the right solution in some cases, but not in others. This type of furniture offers easy storage, especially when you don't have to dig around in a hall linen closet or downstairs laundry room to find your bed linens. 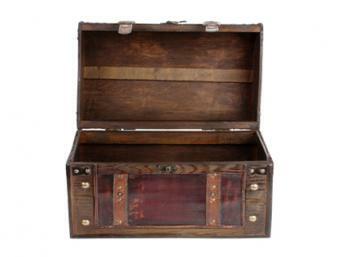 These chests come in very stylish designs that will enhance your bedroom décor. Smaller bedrooms may not be able to accommodate this useful piece of furniture, so be sure to measure the bedroom before purchasing. If room size limits your choice, a chest of drawers might not be the ideal storage solution. Consider under-bed storage instead. 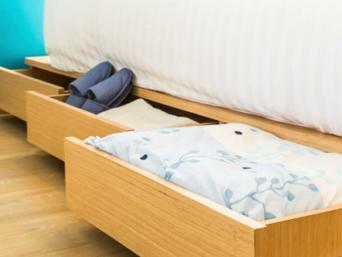 One of the easiest ways to store bedding is with a built-in bed frame storage unit. The only real concern for placing a storage bed is making sure there's enough room to open the drawers all the way. The best design is a subtle style that's hidden and flush with the bedframe when closed. A bookcase headboard platform bed with four built-in drawers has many storage capabilities. Storage beds are a popular option. However, there are still pros and cons to using them. The drawer size is perfect for storing blankets, extra sets of sheets and pillowcases, quilts and comforters. You can further hide the storage drawer with a floor-length bedspread or a bed skirt you can lift to reveal the drawers. Some units have drawers that begin to stick, get off track or no longer close flush. Be sure to check ease of use before purchasing. There's often enough space between the bottom of the bed and the top of the drawers for dust and pests to enter. 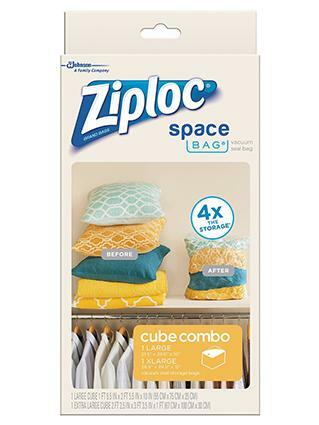 Ziploc® makes the Space Bag® Cube Combo Pack, and the company claims it can reduce up to 75 percent of storage space requirements. These bags are easily stored. For limited storage, you may wish to try the hanging space bags. Buy a few blanket hangers to place in hanging space bags and store in a hall closet or guest bedroom closet until needed. This can be a solution for storing bulky, out-of-season pieces or extra bedding, such as a heavy comforter and blankets. The bags seal out dust and insects, so they're great for long term storage as well. The biggest drawback to packing multiple bedding items in one bag is having to reseal the bag once you've located the item you need. It may be more advantageous to use smaller bags to store individual items used more often. A traditional quilt rack is often the answer to bedding storage challenges. An old-fashioned blanket rack goes with a country cottage, cabin or Americana bedroom theme. A metal scroll blanket stand is a great addition to almost any bedroom design, especially if you have an ironwork bed or headboard. 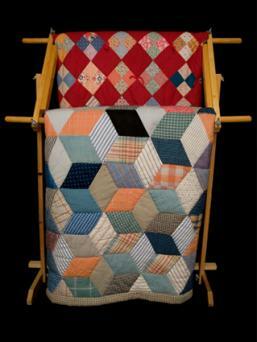 This type of decorative storage rack can be used to display heirloom or prized quilts and blankets. Place one in an unused corner in the bedroom, next to a corner chair, or in front of a window. These racks often make better displays than true storage options, but they're still useful. The dual function of the rack provides needed storage and a display of cherished linens. Rack designs are often as beautiful as the items stored on them. Retrieving one quilt or blanket may sometimes be cumbersome depending on size and bulk. Hang quilts and blankets used infrequently the lower rods. Open storage such as this allows dust to settle on the bedding, so occasional cleaning will be necessary. You may prefer a do-it-yourself project for adding bedding storage. 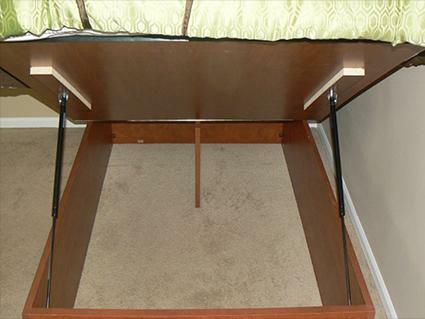 DIY Fun Ideas offers a clever way to create an under-the-bed storage unit. Paint an old bookcase and turn onto its back. 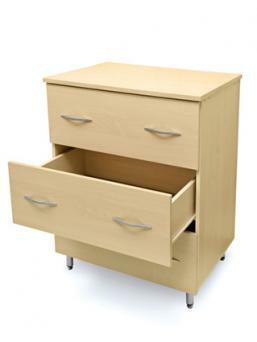 Add drawer handles on the long side, four caster wheels and you have an amazing under bed storage unit. Consider the following points before you decide whether to start this project. This project offers a great way to up cycle an old bookshelf. This storage solution is less expensive than purchasing a storage bedframe. Adjustable bookshelves need to be secured with wood glue or screws. Permanently fixed shelves can't be adjusted for linen sizes. A DIY hydraulic lift kit helps you make use of space that would otherwise be wasted. You'll enjoy hidden storage while maintaining optimum floor space in the rest of the bedroom. Once installed, you can lift the mattress effortlessly to reveal the ample storage underneath. Some carpenter skills are needed. If converting your bed is too challenging, you may need to purchase a more expensive hydraulic bed that's ready to use. A few quick tips can make it easier to access and use various types of storage solutions. Glue or screw a handle onto an under bed storage box or bin and attach a cord. Add a small eyelet hook along the underside of the bed frame, loop the cord through, and tie a knot so the cord stays in place. Simply pull on the cord to bring the bin to you. This will ensure that whenever you need the storage box, you won't need to crawl underneath the bed to retrieve it. You can utilize the floor space of your closets with a large, deep metal mesh bin or two to hold bulky comforters, bedspreads or coverlets that aren't used often. This solution keeps these items out of your way, but within easy reach. A grommet handle fabric tote that can also be used to store bedding. 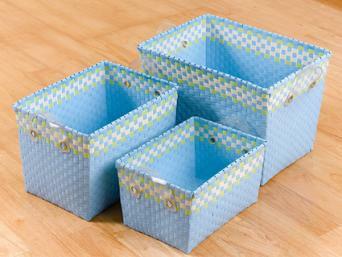 InterDesign® Zia Stack and Slide baskets are great for storing bedding. The crate-like design with handle openings allows you to carry the baskets wherever you need them. The baskets are clear so you can see what is inside each one. If you're looking for a way to store pillowcases that aren't paired with a sheet set, consider adding an over-the-door wicker basket rack. You can separate the pillowcases into whites, colors and prints for easy sorting. It's easy to get your bedding sorted and organized once you have ample storage. Overcrowded closets and drawers can be freed up, and you can have easier and better access to sheets, pillowcases, blankets and other bedding items than you ever did before.